Figure 1. 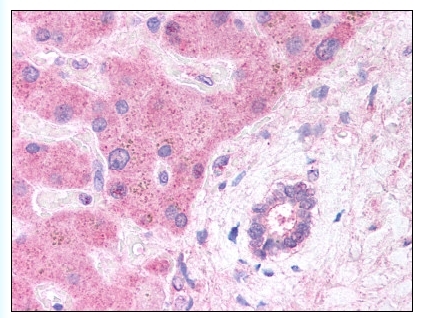 Formalin-Fixed Paraffin-Embedded (FFPE) on Hepatocytes and Bile Duct. 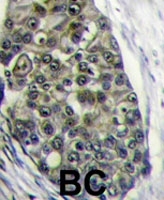 Formalin-fixed and paraffin-embedded human breast carcinoma tissue reacted with LRP6 polyclonal antibody ( Cat # PAB4736 ) , which was peroxidase-conjugated to the secondary antibody, followed by DAB staining. This data demonstrates the use of this antibody for immunohistochemistry ; clinical relevance has not been evaluated. Western blot analysis of LRP6 ( arrow ) using rabbit LRP6 polyclonal antibody ( Cat # PAB4736 ) . 293 cell lysate ( 2 µg/lane ) either nontransfected ( Lane 1 ) or transiently transfected with the LRP6 gene ( Lane 2 ) ( Origene Technologies ) . The cell lysate derived from conditioned NIH/3T3 was immunoprobed by LRP6 ( phospho T1479 ) polyclonal antibody ( Cat # PAB12632 ) at 1 : 500. An immunoreactive band is observed around ~ 180kDa ( 1 ). This band is abolished by pre-incubation with immunizing peptide ( 2 ). Dot Blot : 1 µg peptide was blot onto NC membrane.A : Non-related phospho-specific peptide.B : LRP6 ( pT1479 ).C : Non- Phosphopeptide LRP6 was blotted by LRP6 ( phospho T1479 ) polyclonal antibody ( Cat # PAB12632 ) a 1 : 2000 dilution. 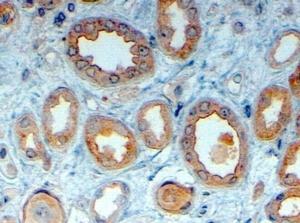 The cell lysate derived from NIH/3T3 was immunoprobed by LRP6 polyclonal antibody ( Cat # PAB12700 ) at 1 : 500. An immunoreactive band is observed around ~180kDa ( 1 ). This band is abolished by pre-incubation with immunizing peptide ( 2 ). Western blot analysis of LRP6 (arrow) using rabbit polyclonal LRP6 Antibody (C-term T1546) (Cat# TA302210). 293 cell lysates (2 ug/lane) either nontransfected (Lane 1) or transiently transfected with the LRP6 gene (Lane 2) (Origene Technologies). 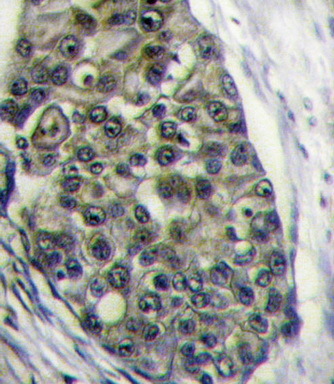 Formalin-fixed and paraffin-embedded human breast carcinoma tissue reacted with LRP6 Antibody (C-term T1546)(Cat.#TA302210), which was peroxidase-conjugated to the secondary antibody, followed by DAB staining. This data demonstrates the use of this antibody for immunohistochemistry; clinical relevance has not been evaluated. 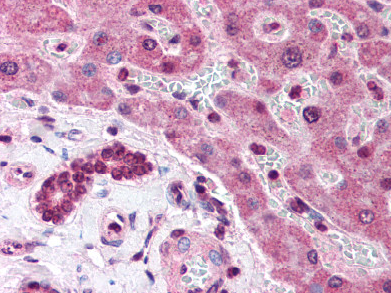 (4ug/ml) staining of paraffin embedded Human Kidney. Steamed antigen retrieval with citrate buffer pH 6, HRP-staining.